Blue Lake Country - Our Man In Canada #122 - week 169, Fly Anglers OnLine. Ask anybody where the Penokean Hills are and, if he or she is bold enough to guess, the likely response will probably be "southern Alberta, I think". Tell that same person that these hills hold some of the best multi-species trout waters around, and the blank expressions will get blanker! Mention that the area resides amongst northern Ontario's greatest concentration of natural trout lakes and you'll probably be able to hear a pin drop. Only a handful of fishermen, and even fewer fly fishers, know about the outstanding angling that is available in this part of Ontario. Stop by any tackle store or gas station from Elliot Lake to Iron Bridge and you are liable to see photos of some of the angling success stories for which this area has justly become famous. For me, the Penokean Hills, and more broadly, Ontario's North Shore Region (from Espanola to Sault Ste. Marie) have always held a certain fascination. From the times I first saw some of those gas station photos of six-pound plus brook trout, I wanted to find the glory holes where I could catch them. It's not only the fishing, however, which is spectacular in Penokean Hills Country–the landscape is rugged, ever-changing and the lakes are mainly spring-fed and crystal clear–often with a greenish cast that is reminiscent of the trout waters out West. 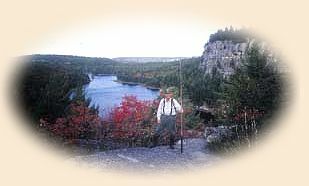 Trout were introduced to the Blue Lake area in 1944 by Vic Rutledge, who was one of the first to realise the recreational potential there. Carrying several dozen rainbow trout fingerlings in milk cans along the 27 kilometre Blue Lake Trail and stopping every hour at freshets to replenish the water supply, Rutledge managed to get the fish in and release them into Blue Lake. By the end of that decade, they'd moved upstream from Blue Lake into Robb, Townline, Elbow and Whitebear Lakes, and downstream into Dougall and Endikai Lakes. Lake trout and brook trout were stocked later, and all three species established naturalised populations throughout the area. There has been no stocking of the major naturalised waters since the late 1950s. Today, the mix of lake trout, rainbow trout and brook trout has been recognized as the province's only self-sustaining inland three-species trout system. 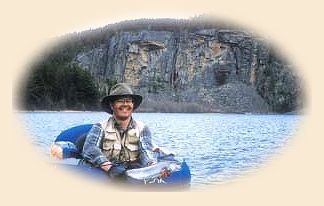 In 1997, I fished one of the main lakes with three visiting American fly fishermen. One of them, during a 20 minute span along a scree slope below a 400-foot cliff face caught a 20 inch rainbow, a 14 inch brookie, and 20 inch lake trout on the same fly! He was ecstatic. While almost every small pond and lake in this region holds trout, there are some locations where the bounty is more plentiful. One such area is that surrounding Kirkpatrick Lake–locally referred to as Blue Lake. The watershed encompassing Blue Lake (holding over 100 lakes and as many small streams) is one of the most interesting trout systems in Ontario, if not all of Canada. This is because it harbours three self-reproducing trout species within several of the bigger stillwaters and yet also provides exceptional opportunities for big brookies in the smaller ponds. Six large lakes, all connected to the West Little White River, contain brook trout, lake trout and rainbow trout. What is even more amazing is that these fish are naturalized. They were planted here in the mid-1940s and 50s and have never been re-supplied since. As such, each species has developed into a unique strain that are often unlike any others seen elsewhere in Ontario. The rainbows are loaded with black spots over their entire bodies–similar to those of Alaska. They are robust fish, with tremendous splashes of burgundy, hot pink and olive-green. The lakers are also heavily spotted and a dusky bronze, sometimes fading to bluish-grey. The Blue Lake area, due to the trout preserve policies in place, is only accessible by canoe, hike-in or fly-in means. It is a roadless area, off-limits to highway vehicles. The closest highway is 546 from Iron Bridge to Elliot Lake. A canoe trip in to Blue Lake from the highway takes one day, hiking can take up to two days. There are three outfitters who operate camps or outposts in the area. One in particular, the Blue Fox Camp, actively encourages fly fishers and promotes fly fishing because it appreciates fly fishing's conservation ethic, especially catch-and-release. Although there is some good river fishing, the fishing in Blue Lake country is primarily on stillwaters, from ponds to large lakes. The major food items in the Blue Lake watershed are crayfish, leeches, dragonflies, damselflies, scuds, mayflies, midges, caddis flies, and baitfish. The leeches, which trout feed on year-round, are usually black, or dark brown, and range in size from two to four inches. A marabou or rabbit strip pattern provides an excellent imitation. They're effective for lake trout fished deep during the summer migration to colder water. Blue Lake dragonfly nymphs are dark olive green with thick abdomens and typically measure about two inches long, while the damsels are olive green, slender, and about one to one and a half inches long. The scuds are either dark green or cream and about half an inch long. Unlike scuds, dragons and damsels can be fished higher in the water column, but all three are best used closer to the bottom, especially around beaver lodges, deadfalls, and weeds. Patterns tied with some sparkle in the dubbing and picked out to look "buggy" work the best. Mayflies come in most of the familiar hatches of the south, but the most important is the large Hexagenia (Brown Drake) hatch, which usually occurs in mid-June. Dry flies with a natural deer-hair tan body are excellent impressions of these flies. Midges are also an important trout food on these stillwaters. 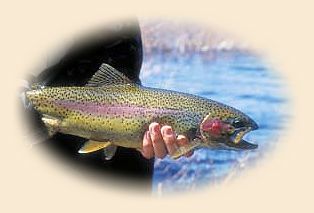 During mid-summer, rainbows, particularly, will feed selectively on adults on the surface and in the film. Any small buzzers, midge emergers work well, while weighted midge patterns are effective fished from the bottom up. Caddisflies tend to be more important on the rivers and in the back lakes (where it's mostly brook trout). Rhyacophillidae and Limnophillidae are the most important, and are most effectively imitated with wet flies and emergers with bright green or yellow-green abdomens and brown thoraxes, particularly with sparkly dubbing and picked out fibres to create a "halo". 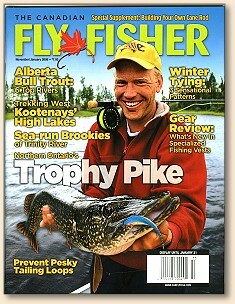 We thank the Canadian Fly Fisher for re-print permission!